The complete guide to find all the hidden weapons in the streets Yharnam. In this section of the Complete Guide to Bloodborne will show where to find and how to unlock all the weapons in the game to get the THE HUNTER’S ESSENCE trophy. BLADES OF MERCY '(40000 Blood Echoes): You'll have to get the CROW HUNTER BADGE FROM HUNTER EILEEN, to do it you can kill or complete his side quest. BURIAL BLADE (60,000 Blood Echoes): After the gate at the end of the game, you will be asked to make a choice. Choose REJECT to get the weapon after the clash. ANNALISE: Kneel in front of her to join the Vilebloods and get item with which to unlock the weapon in the store. WARNING: If Alfred kills before getting the sword, you can take the badge from his corpse and use it to great passage located behind the area where is located Ebrietas, Daughter of the Cosmos. This way will restore the life of Annalise and you get the sword. HUNTER AXE (1100 Blood Echoes): It is part of the STARTER PACK and can be chosen to start the game. Alternatively it can be bought in the store, after taking its distinctive in YHARNAM SEWER, more precisely in the area with the pig. KIRKHAMMER (3000 Blood Echoes): Defeat the Cleric Beast to get the Sword Hunter Badge that unlocks this weapon in the store. LOGARIUS’ WHEEL (13000 Blood Echoes): You can obtain after giving ALFRED to a particular object called "Unopened Summons". After delivery, come back and see what happens. The object in question you can find it in the same room in which is located in the Cainhurst castle. Alfred instead is in the Church, at the entrance to the Forbidden Woods and after eliminating the VICAR AMELIA. LUDWIG'S HOLY BLADE (20,000 Blood Echoes): From CHAPEL OEDON enter the door on the right and take the elevator (this door opens only after defeating the bloodthirsty beast). Cross the bridge and go up in the tower. Just before you get to the door in the small room at the top you will find a treasure chest containing the BADGE to unlock this weapon. WARNING: This is one of the most powerful weapons in the game, maximized reach an attack value of 200. REITERPALLASCH: You will find it in a chest in the castle CAINHURST. RIFLE SPEAR (4000 Blood Echoes): To get the BADGE that unlocks this weapon in the store, you'll have to eliminate Djura, the hunter with the gatling gun on top of the tower located at OLD YHARNAM, or complete his side quest. To find it. SAW CLEAVER (1000 Blood Echoes): It is part of the STARTER PACK and can be chosen to start the game. Alternatively it can be bought in the store, after taking its item in SEWER OF YHARNAM, more precisely in the area with the pig. GUN LANCE (1000 Blood Echoes): For OLD YHARNAM, after convincing Djura, the hunter with the Gatling, stop shoot, patrols the area below the tower, where he wanders another hunter. Look near the left of the wall with the scale that you back towards the area in which Djura starts to shoot for the first time. You'll find that you can get out on a balcony. Go down and enter the house you find, eliminate enemies and climb the stairs. Just before you reach the top floor, look between the cabinets on the left to find the weapon. Alternatively it can be bought in the store, after taking its distinctive in SEWER OF YHARNAM, more precisely in the area with the pig. 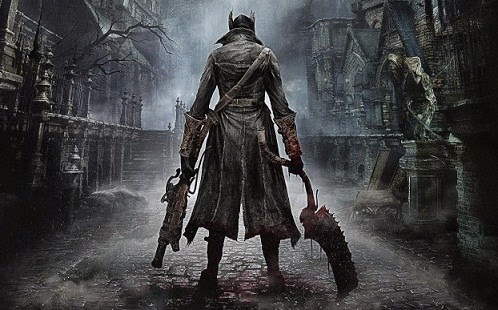 STAKE DRIVER (8000 Blood Echoes): To get the BADGE that unlocks this weapon in the store, you'll have to eliminate Djura, the hunter with the gatling gun on top of the tower located at OLD YHARNAM, or complete his side quest. To find it. THREADED CANE (1200 Blood Echoes): It is part of the STARTER PACK and can be chosen to start the game. Alternatively it can be bought in the store, after obtaining Saw Hunter Badge in SEWER OF YHARNAM, more precisely in the area with the pig. TONITRUS: The ransacking can be found in ADVENT PLAZA, on a corpse. BEAST CLAW: This weapon can only be found in the dungeon of the Ailing Loran Chalice. Look in Layer 2 treasure room. CANNON: It is located between the beams of the building larger than found in PROHIBITED WOODS, just behind the man who fired the cannon. You will have to look for a window overlooking the balcony outside to reach the keys. Search the corpse leaning on a gear. EVELYN: You can find it in the casket at the center of the 3 tables in CAINHURST Castle. To get to the treasure chest you'll have to roll from the small scale on one of the tables. FLAMETHROWER (8000 Blood Echoes): Talk to the NPC GILBERT, find more information in our MISSIONS GUIDE. HUNTER BLUNDERBUSS (1700 Blood Echoes): It is part of the STARTER PACK and can be chosen to start the game. Or be purchased later at the store. HUNTER PISTOL (1600 Blood Echoes): It is part of the STARTER PACK and can be chosen to start the game. Or be purchased later at the store. HUNTER’S TORCH: You will find it in several places to OLD YHARNAM. TORCH: You can find it next to one of the first BRUTI (enemies big and slow) you meet, more precisely what is knocking on the big wooden door in the plaza with fountain YHARNAM CENTRAL. LUDWIG'S RIFLE (10,000 Blood Echoes): From CHAPEL OEDON enter the door on the right and take the elevator (this door opens only after defeating the bloodthirsty beast ). Cross the bridge and go up in the tower. Just before you get to the door in the small room at the top you will find a treasure chest containing the BADGE to unlock this weapon. REPEATING PISTOL (3000 Blood Echoes): This will defeat the Cleric Beast to get the Saw Hunter Badge that unlocks this weapon in the store. ROSMARINUS (60,000 Blood Echoes): the badge unlocks this weapon is in the room darker area of the Choir of the Church. WOODEN SHIELD: Exit the CHAPEL OEDON go straight. Go up the long flight of stairs to the right and searched the corpse, up the stairs, slumped to the right of the large gate.